Every once in a while Conor Palmer, Commercial Director at Peterson, lands back in Sallynoggin long enough that we manage to exchange an email or two before he’s back on the road, and not long ago he offered to send me some of the SPD 2017 samples to review for the blog, so here they are! I’m smoking my SPD 2016 L Tankard as I write this, in part to highlight the contrast between the 2016 and the 2017 pipes. * Last year’s SPD all about traditional styling and finish. 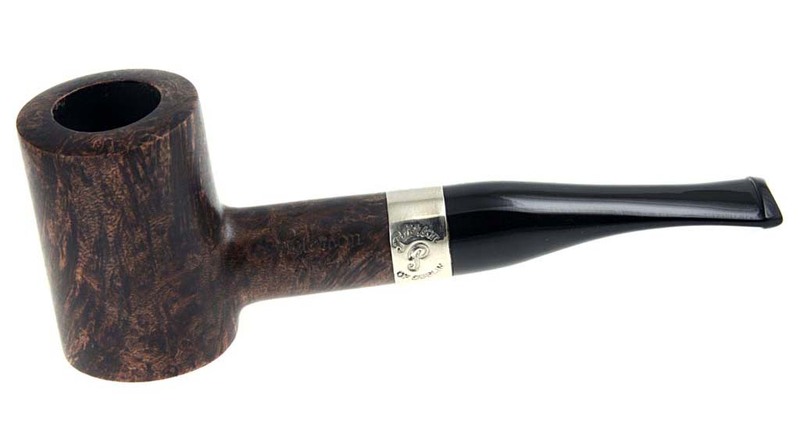 If you chose your pipe carefully, you got a really nice piece of briar at an outstanding price. The downside, according to Conor report from his distributors anyway, was that they didn’t shout St. Patrick’s Day. They weren’t green. 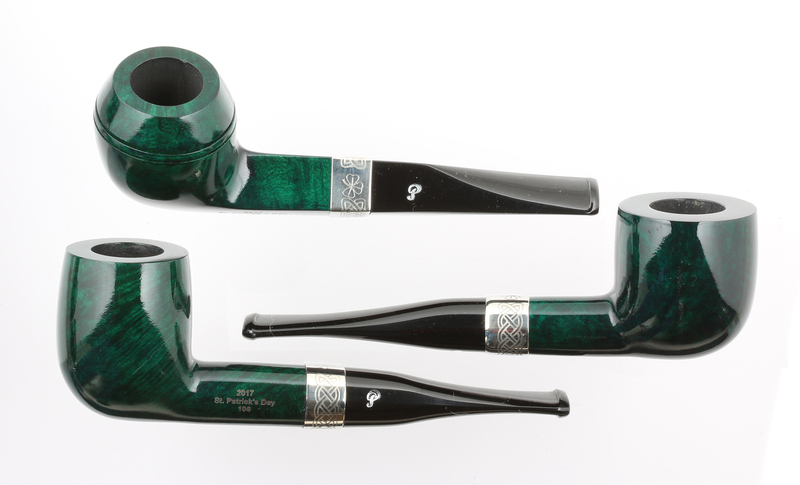 They’ve got a point, I think, and Peterson has responded with the finest green SPD pipe they’ve ever produced — and that’s saying something in the history of this collectible! However, it also leads me ask: is “the green thing” also a generational thing? I’m asking, because I don’t honestly know. Are Millennials more interested in non-traditional stain colors (that is, not shades of brown, red or orange)? I know Tom Palmer has said more than once that System pipes and high-grade Petes (with their brown and orange stains) are something mostly Baby Boomers and stodgy Gen X’s like myself are still smoking, but I’m not convinced that’s entirely accurate. 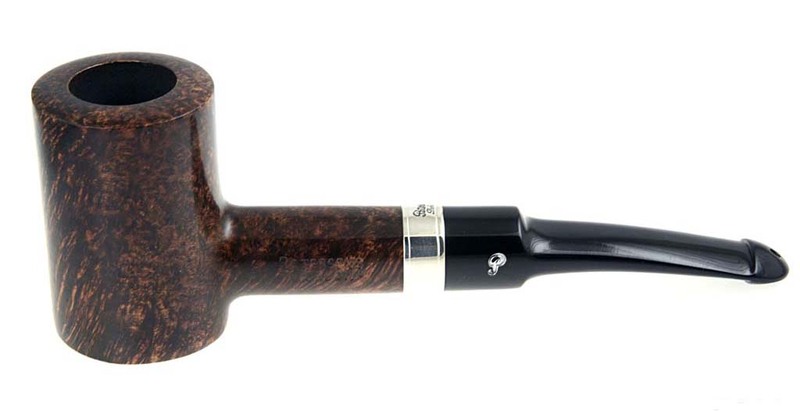 High-grade Petes, after all, are still only moderately priced when compared to most artisan pipes. Anyway, Huzzah! for the wearing of the green on the 2017 SPDs — what better place could there be? My photographs do fair justice to their high-gloss (lacquered?) eye candy. I say “fair,” because when the pipes aren’t under the photographer’s light, they’re darker to the eye, not green-black, not as dark as the 2016 Christmas Army maroon matte pipes, but dark green. Grain on the 2017 SPDs is visible under daylight conditions, if not under most artificial indoor lighting. 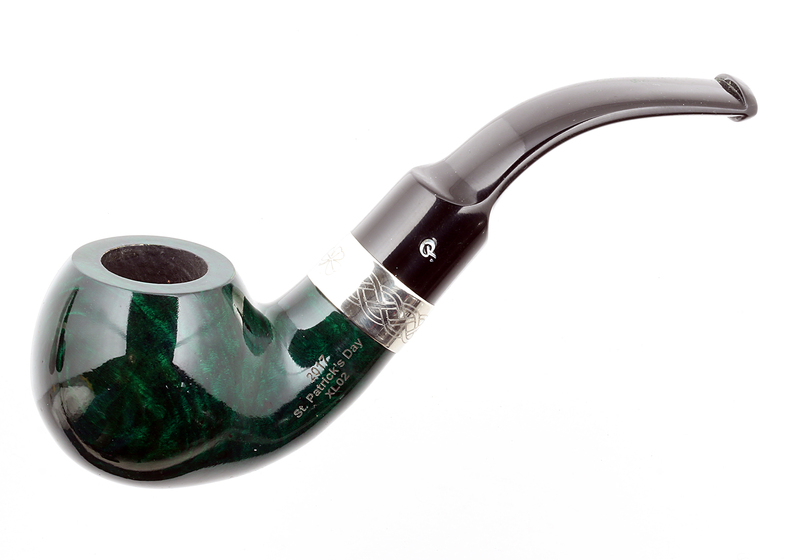 And I say “eye candy” because the laser-engraved nickel bands with their Celtic knot design and shamrock, pop nicely. I would prefer a stamped band, but I realize this not only a matter of taste from my end, but probably one of economics from Peterson’s end. Stamped bands seem to appear only on sterling mounts, but even they are sometimes laser-engraved (the Writer’s Collection comes to mind). After all the acrylic-stemmed 2016 army-mounts, it’s great to see a “Navy” (flush) vulcanite mount as well – “Navy” being Peterson’s old term for the flush mount stem. The mouthpieces seem to be the same rod quality and cut as last year’s, so no degradation there. The P is hot-foil stamped, which means you need to be a little picky about the pipe you choose, as sometimes the silver foil stamping isn’t as clean as it might be. This is annoying, because I know other pipe manufacturers have been able to figure out a way to stamp their logo (or implant it) so that it won’t flake off the first time the stem needs deoxidizing. I am pleased with the great job Peterson has done on the laser-engraving as well. They’ve included the line, the year and the shape number. Collectors want all this information, and some of it has been lacking in earlier laser-engraved releases. From the dozen shapes chosen this year all are standard issue aside from the one collector’s piece: the incredible B56, taken from the 2011 Adventures of Sherlock Holmes Sylvius. This is what I’d call a short-stack billiard, although it’s probably a bit shorter than most pipemen’s definition. The shape itself is a meatier, or perhaps more voluptuous, older sibling of the 2016 Limited Edition. You can see the original Sylvius below, as well as the B56. And finally, here’s the PDF flyer — pass it on and spread the word. March 17 is just around the corner . . . almost! This shape has been given a number! It had only been known as the LT or Large Tankard since its introduction in the 2010 Mark Twain set, but it appears that shortly before the 2016 Limited Edition appeared it was given the D19 number. It has appeared in three lines that I know of so far—all in Italy: the Killarney, the Aran and the Wicklow. Check out that P-Lip on the Wicklow below! I agree, the 2017 offerings look a step up the ladder in the finish department (but I always worry about the lacquered finish). The stem shaping is definitely attractive, particularly on the Sylvius. Thanks for the sneak peak and Happy Thanksgiving! I’m glad you mentioned the whole “lacquering” question, because that’s something I see in the forums from time to time. 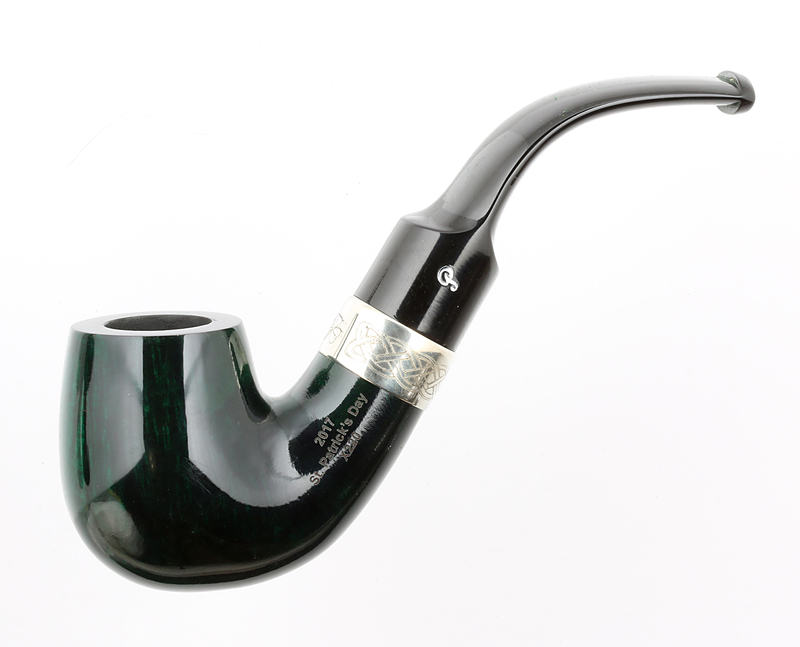 We’ve got a list of all the lines Peterson lacquers in the book, and honestly I didn’t email Tony to see if this pipe was lacquered. I’m sure you’ve read a blast in the forums about Peterson’s lacquer finishes–it’s a story often repeated. 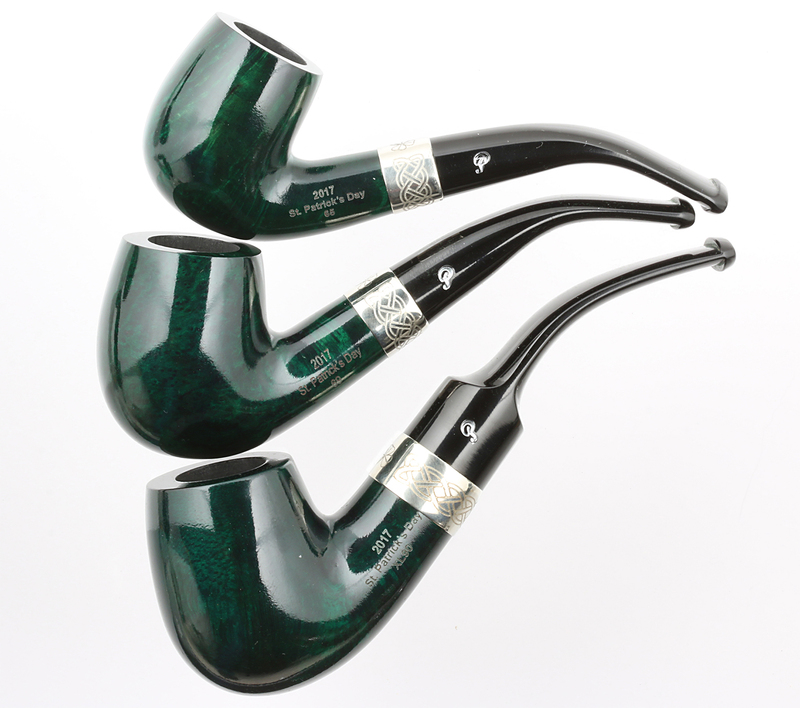 For all I know it may be true, but I do smoke both Ser Jacopo and Radice pipes that have been lacquered–really fine pipes–and don’t notice any difference whatsoever between them and the non-lacquered variety. I’ve actually applied lacquer to an old Pete 356 System that I couldn’t raise a shine on, and it’s such a delicate operation. The lacquer has to be applied so very, very thinly. 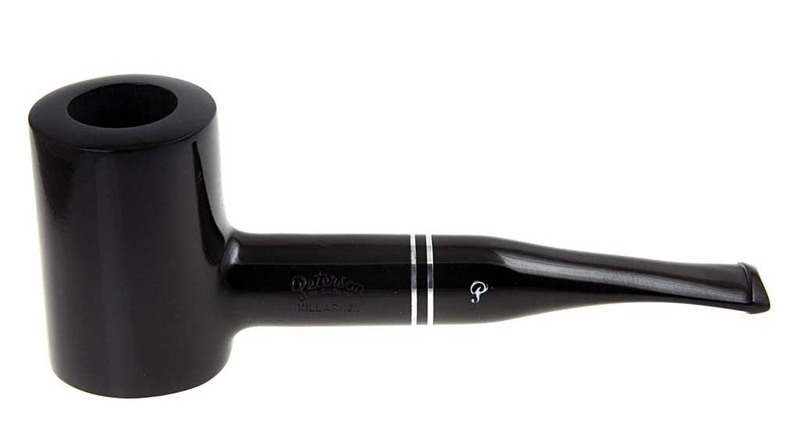 Anyway, it solved my “shine” problem and the pipe’s a great smoker. Personally, I’ve never owned a lacquered pipe, so I can’t offer a personal experience. That is also a restoration technique that I’ve not yet attempted. Is the process detailed anywhere? The lacquering process hasn’t been written up as far as Peterson is concerned. I believe it is done by hand by Martin, but what you’ve said makes me want to know for sure. Expect to see your answer in the book. I was thinking more of a restoration process, I can’t recall anyone doing that on in the normal blog/forums. I believe one uber-high end Japanese maker uses the lacquer process for his new creations. I agree with upshallfan. I’m looking forward to seeing these being available, however. I really liked the matt finish of the 2016 and I have the LT as well that I really. I only wish that the stain would remain green especially on the shank and not be “burned off” by smoking. So often the green changes to brown after a few smokes. And thanks for the latest issue! I look forward to every one and post the internet link on the Smokers Forum Peterson Thread that I moderate. I’m thinking Conor will go back to matte brown next year. Variety is at the top of his agenda, so I doubt we’ll see green two years in a row. 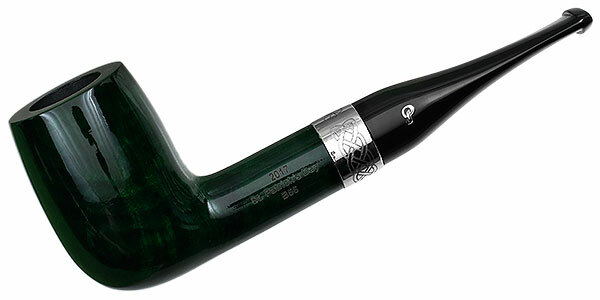 Now your comment on the green burning off is really interesting, since I don’t own and smoke a Pete in green finish. Does the stain turn around the bowl’s cheeks, or just on the bowl rim? And many, many thanks for getting the word out to the Smokers Forum, Tom! The stain only turns brown or disappeared on the shank and not around the bowl. I don’t understand why as there’s much more heat around the bowl than the shank. 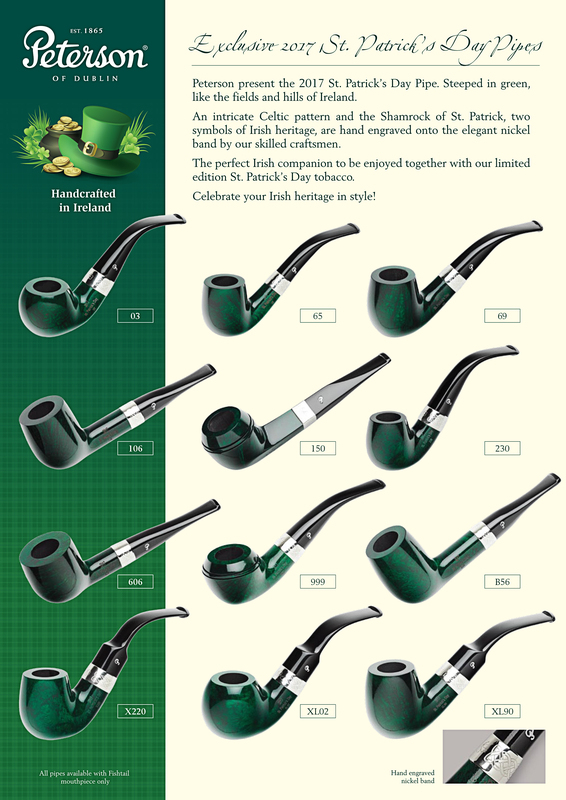 I’ve also had the same problem with the green stain on Peterson Meerschaums. I wonder why this is happening. The bowl doesn’t lose its stain. It’s the shank! You’re welcome about the Forum. I’m the Peterson Moderator on the Forum and I always alert others to check out your threads. This I would like to see and pass along to Peterson. Send me some photos when / if you get a chance, Tom. They should know about this. I can send you images of my Pete’s. How do I insert them here or do I need to send you a separate email? I don’t have any green in my own rotation, although I might pick up the B56 if one surfaces next year. I’d take one of each if my finances allowed, but I’ve fallen in love with the B56! What a lovely Emerald Isle chimney ’tis! I’ve only smoked it in its Sylvius P-Lip dress, but it’s a regular in my rotation. Just a delight.